In June 1969 Jules Maidoff was running a highly successful design studio in New York that he had started a decade earlier. He was at the center of the New York art scene and living well—with a young family and a large apartment on Riverside Drive and a weekend home in Bucks County, Pennsylvania. But something was missing. Maidoff had trained to be an artist, studying first at Cooper Union, then earning BA and MA degrees from CCNY before spending a year as a Fulbright scholar in Florence. Now 18 years had passed since his year abroad and he was still not painting full time. Instead, he was a commercial artist, doing what others were paying him to do. He asked himself, “Can I try to alter my way of life, can I try to redefine my role to one of painting and seeing what my own images might become?” and concluded there was only one way to find out. In the spring of 1969 he and his wife researched the possibility of relocating to Tuscany and found a huge stone farmhouse less than an hour outside of Florence. By 1970 the purchase was finalized. The family spent the summers of 1971 and 1972 staying in the house and helped design and refit the 17 rooms to include a painting studio in the ex-hayloft (fiennile), setting up the bedrooms for their six children, and getting to know the town while coming to understand better what the reality of living in Italy might mean. In June 1973 Maidoff came over with Gillian and four of their children. He was now 40 years old and starting over. In Italy he soon began to exhibit and sell some of his work, but not enough to support his family. To earn a living he turned to teaching, first by advertising for students in The New York Times and running summer workshops in his home. The summer program in Pian di Sco was called Studio Art Center of Tuscany, but the income was modest. Luck came as the news of his summer program reached other expats with art programs in the area. Together they rented space on Via ginori 14 and the Studio Art Center of Tuscany became Studio Art Centers International (SACI), a nonprofit U.S. entity with Jules as the resident director. 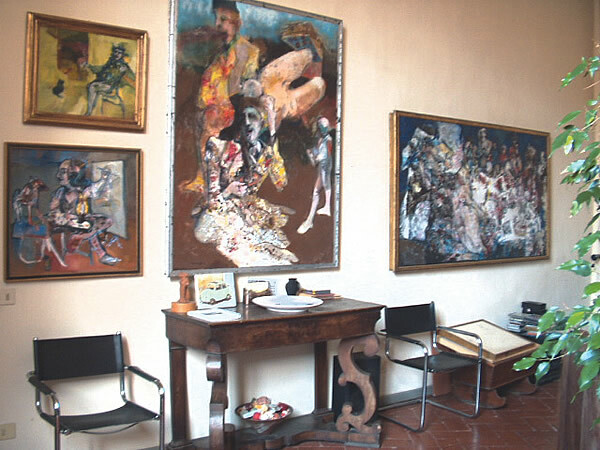 In 1996 Maidoff retired as director after building the school from 12 students with a basic curriculum to the largest U.S. university-level art school in Europe, now housed in its own sixteenth-century palazzo in the center of Florence. 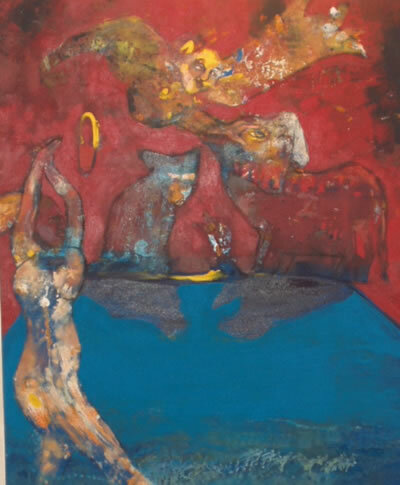 “I owe the creation of SACI and my choice to create my life as an artist in Europe to the Fulbright award I received to come to Florence in 1956-7,” he said. Palazzo dei Cartelloni in Florence: Home to the SACI art school. We spoke with Maidoff in the studio of his sprawling stone farmhouse overlooking the Arno and the Chianti hills where he welcomed his first students in 1973. Clay Hubbs: Many readers may have similar dreams of abandoning a job that is no longer satisfying and moving abroad. What advice would you give to someone who would like to follow your example? Jules Maidoff: Although it may seem more difficult now than 32 years ago, the answer lies within you. Do you really want to change your life? For me the risk was as frightening then as it would be for you today. Florence may no longer be as viable as it was back then, but there are many parts of Italy—and the world—that will provide the opportunities I found. If you haven’t already traveled to places that caught your imagination, do so now. Learn some languages. Don’t choose a location where too many others have also gone and forced the prices up while eroding the genuine cultural ambience. I advise you to stay relatively close to a large city where there are libraries, cultural events, and medical services. Children complicate matters even more. You will have to ask: “Will they be able to become bi-cultural?” The pluses are many, but every family should review the eventual impact on all its members. CH: What was the impact of the move on your family? JM: The traumas were matched by the rewards. We made many mistakes, but we learned so much about ourselves and about the new society we moved into. It made us all richer. We had to find out things like what were the advantages of Italian schools over international schools. All the children who attended Italian schools now have advanced degrees and are certainly more broadly educated than they would have been had we stayed in the States. And of course all are bilingual. Another great plus for us in moving was the generally excellent healthcare services, which in Italy are still nationalized. CH: Did you have to give up your citizenship? JM: I’m still a U.S. citizen. Until recently, Italy, like most European countries, had fairly reasonable qualifications for being a resident alien. It’s important to know the regulations before you go, but if you really want to do it you’ll find a legal way to be a good foreigner. The main thing is to treat the often-complicated rules as a fact and to deal with them with respect. CH: After 32 years do you feel more American or Italian? JM: I’m an outsider, a knowledgeable outsider. Those immigrants who feel they have really gone native have probably missed the point. For people in the creative areas—musicians, scholars, artists—the position of an outsider is desirable. It breaks the false bubble of security, of thinking you know all the rules. Being a foreigner who has learned the local language gives one the rewarding possibility of seeing how all people have the same needs but find varying cultural ways of satisfying them. This helps you get closer to some universal truths. Life is more exciting when part of every day includes learning something new. CH: Do you travel much now? JM: As an artist who exhibits in a lot of different places I do indeed travel. I like to use the European rail system which overnight gets me from Florence to Paris or Barcelona via Milan. Coming to Italy meant coming to live in Europe. I have made friends through my work as both an academic and as an artist in Florence, Amsterdam, Lisbon, Madrid, London, and all over Italy. They range from gallery owners, artists, ex-students, and writers to the storekeepers, the mayor of Pian di Sco, and individuals within the Italian cultural structure, all of whom are more than just contacts. When I am in places as varied as Paris, London, or Madrid I am invited to participate in what is going on in town: I am at dinner at the homes of these “foreigners” who I no longer see as foreign. I am included in their lives. All of these rich experiences are ones that I do not think would be possible if I had not accepted the risk of being an outsider. CH: Do you have to be an artist or a scholar to do what you did? JM: No, but it helps a lot, as you can see by what I just said. To define the choice of whether this risk is worth taking one should ask oneself, “What is it I really am willing to do to find out about myself?" If your choice to move is in response to that question, your migration will be more than changing locus. CH: Now that you’re getting on in years do you have retirement plans? JM: I’m confronting this issue right now. I’m 72. Despite the fact that I’m an active painter, this house is no longer used as in former years. My children have developed their own worlds and ways of being. I’ll probably soon put it on the market to fund retirement and find a smaller place in Florence. CH: Are senior citizens well treated in Europe? JM: The state social services system, along with many private agencies, has an articulated system of housing and care for the elderly. In general, the elderly are treated like people and not put out of sight. Almost every town of 20,000 or more has old-age facilities so families can be nearby. These are right in town not hidden away. Families try to keep the elderly with them, and the healthcare system supports this. I think it is harder for the elderly to insert themselves into a new society and my story is really about making the choice while the challenges are rich and one’s energy and sense of adventure is still strong. Italy is not Florida, and I think that trying to relocate without having a good understanding of the place would not be wise. After one hits 60 the idea of emigrating is intimidating. Some people I know have come over, after many visits, when already “mature.” Yet I see them gathering together in clubs with one another and with the Italians who are Anglo-U.S.connected. A bit of the bubble I referred to earlier.